Expertise combines knowledge, experience, and the approach or process of your consultant. With more than thirty-five years as an administrator, educator, trainer, consultant, and author, Dr. Richard Hough offers consulting and litigation support services in: use of force, law enforcement/police practices, jail practices, juvenile justice and detention, school property and venue security, and commercial and retail business security and liability measures. Dr. Hough has extensive deposition and trial experience and is frequently consulted by the media. Dr. Hough's experience has come in increasingly responsible positions. He also has more than 30 years experience teaching criminal justice, private security, and public sector management courses at the college and university levels, police and corrections academies, in-service training, and seminars. Dr. Richard Hough has provided consultation and training on a wide variety of topics for law enforcement, juvenile detention, jails, corrections, and non-profit agencies. In addition, he has served as an expert witness in use of force, police practices, juvenile detention, corrections management, and security practices cases for plaintiffs and defendants. 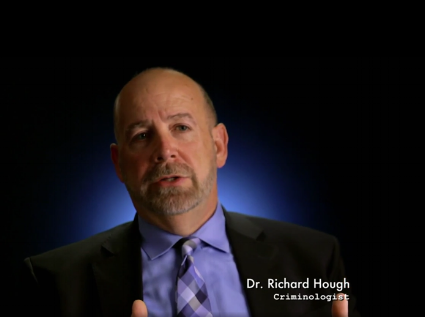 Dr. Hough is in the minority of career criminal justice professionals who have worked extensively in the field and at high levels, and who have a strong educational and teaching background to augment his professional work experiences. Dr. Hough was honored by the British Society of Criminology by being named an International Ambassador for 2018-2020. Dr. Hough is proud to be a member of the Calibre Press team of columnists and invited as reviewer of the book Street Survival II. If you are in need of the expertise of a criminal justice professional who has in-depth policy and practitioner experience, please contact Dr. Hough to discuss your specific case needs.